Our “Community-Organizer-In-Chief” and other key players in his White House, including Vice President Biden, have believed that our military presence in Afghanistan would be relatively short-lived and limited. The Pentagon pays lip service to that, but otherwise does essentially what it wants to do, as it did with Bill Clinton. First, Joe Biden wanted to carve up Iraq three ways: part for the Sunnis, part for the Shiites, and part for the Kurds. Second, Barack Obama was opposed to the war completely; and of course he opposed George W. Bush’s troop “surge” that essentially won the war. [T]his could be one of the great achievements of this administration. Really? Now that they are claiming credit for having won the war that they opposed consistently, what about their war in Afghanistan? The LA Times article added: “Biden did not elaborate on what all the administration’s other ‘great achievements’ were so far”—probably because there are none, except for Obama’s Nobel Peace Prize. “I just think that’s just dead wrong,” Cheney said. “I think the biggest threat the United States faces today is the possibility of another 9/11 with a nuclear weapon or a biological agent of some kind. And I think al Qaeda is out there—even as we meet—trying to do that. Clearly, Biden and Obama are presiding over a failed presidency, which is not providing and will not provide the type of leadership that Americans expect and can count on, now or in the future. They are grasping at straws, trying to deflect the criticism that is coming their way; and they are increasingly desperate to do so. The Los Angeles Times has a fascinating article about how America’s “drone warfare” is being conducted. Col. Dale Fridley, a 50-year-old former F-15 pilot, said one of his most rewarding moments as a drone pilot came without firing a shot. After a U.S. military vehicle broke down in the desert in Afghanistan’s Helmand province, a Taliban stronghold, the rest of the convoy returned to base. The stranded soldiers were able to sleep while Fridley’s drone stood watch overhead, awaiting a repair crew’s arrival in the morning. American troops are risking their lives to implement a counterinsurgency strategy that requires winning popular support in Afghanistan, and the main message from America’s Commander in Chief to the Afghan people is that their government can’t be trusted. That ought to make it easier to win hearts and minds. [A]fter being run out of Marjah[, the Taliban] have every reason to tell the citizens of Kandahar that even the Americans don’t like the Afghan government and are short-timers in any case. The Cold, Hard Facts And Reality Of Afghanistan? [T]his recent dust-up with Mr. Karzai—his outburst against the West, his melodramatic statement that he, too, could yet join the Taliban in a campaign of “national resistance,” his indecent warning that those American and NATO forces soldiering to give his country a chance are on the verge of becoming foreign occupiers—is a statement about the authority of the Obama administration and its standing in Afghanistan and the region. Forgive Mr. Karzai as he tilts with the wind and courts the Iranian theocrats next door. We can’t chastise him for seeking an accommodation with Iranian power when Washington itself gives every indication that it would like nothing more than a grand bargain with Iran’s rulers. If Iran’s bid for nuclear weapons and a larger role in the region goes unchecked, and if Iran is now a power of the Mediterranean (through Hamas in Gaza and Hezbollah in Beirut), the leaders in Kabul, whoever they are, are sure to do their best to secure for themselves an Iranian insurance policy. From the very beginning of Mr. Obama’s stewardship of the Afghan war, there was an odd, unsettling disjunction between the centrality given this war and the reluctance to own it in full, to stay and fight until victory (a word this administration shuns) is ours. Consider the very announcement of the Obama war strategy last November in Mr. Obama’s West Point address. The speech was at once the declaration of a “surge” and the announcement of an exit strategy. Additional troops would be sent, but their withdrawal would begin in the summer of 2011. Others could bet on our war weariness, for Americans have never shown an appetite for the tribal and ethnic wars of South Asia and the Middle East. The shadow of our power lies across that big region, it is true. But we blow in and out of these engagements, generally not staying long enough to assure our friends and frighten our enemies. Granted, Mullah Omar and his men in the Quetta Shura may not be seasoned observers of Washington’s ways. But they (and Mr. Karzai) can discern if America is marking time, giving it one last try before casting Afghanistan adrift. It is an inescapable fact that Mr. Obama hasn’t succeeded in selling this Afghan venture—or even the bigger war on terror itself—to his supporters on the left. He fights the war with Republican support, but his constituency remains isolationist at heart. The president has in his command a great fighting force and gifted commanders. He clearly hopes they will succeed. But there is always the hint that this Afghan campaign became the good, worthwhile war by default, a cause with which to bludgeon his predecessor’s foray into Iraq. All this plays out under the gaze of an Islamic world that is coming to a consensus that a discernible American retreat in the region is in the works. America’s enemies are increasingly brazen, its friends unnerved. Witness the hapless Lebanese, once wards of U.S. power, now making pilgrimages, one leader at a time, to Damascus. They, too, can read the wind: If Washington is out to “engage” that terrible lot in Syria, they better scurry there to secure reasonable terms of surrender. Ajami’s conclusions are bolstered by the sight of Obama “kowtowing” to Putin and his ex-KGB thugs in Third-World Russia! This Memorial Day, nearly three-out-of-four Americans (74%) have a favorable opinion of the U.S. military, according to a new Rasmussen Reports national telephone survey. Just 12% hold an unfavorable opinion, and 13% are not sure. These figures have held steady for the past two years. In the wake of what our Vietnam veterans went through, it is wonderful to see the support for our military, especially with two wars in progress, one of which is winding down. Barack Obama ought to heed these results, and do nothing to weaken our military; and in fact, he should take all steps necessary to strengthen it in light of deadly challenges from China, Russia, North Korea, terrorists and elsewhere. President Obama, who opposed the Iraqi surge before it paid dividends, might now—at least privately—sympathize with George W. Bush. Wars don’t follow political calendars or 24-hour news cycles. A commitment to a hard, at times unpopular, fight is the mark of Presidential leadership. Though the conflicts in Iraq and Afghanistan are different, . . . the Administration can only hope this surge turns out as well as the one in Iraq. . . .
On the political front, the U.S. was caught by surprise last week when President Hamid Karzai forced out his interior minister and intelligence chief. Hanif Atmar and Amrullah Saleh, respectively, were close allies of Washington and respected by the NATO brass on the ground. No good rationale has been offered for their removal—except that Mr. Karzai wanted to purge his cabinet of ministers backed by Washington. Citing Mr. Saleh and unnamed officials, the New York Times reported over the weekend that the Afghan leader has lost confidence in America’s commitment to win the war, and is seeking to strike his own deals with the Taliban and their Pakistani patrons. Whatever the truth of this Kabul palace intrigue, the Administration hasn’t helped its own cause with Mr. Karzai. For the first year of the Obama Presidency, the White House went out of its way to undermine the Afghan President, feeding his sense of paranoia. Mr. Karzai’s character and political flaws are obvious, and as the joke goes, his sovereign writ may not extend far beyond the city limits of Kabul. But Mr. Karzai is the elected Afghan President, and Washington must find a way to work with him. The Administration has recognized this belatedly, and last month it hosted Mr. Karzai and his ministers in Washington for a prominent summit. The larger strategic problem is President Obama’s decision last year to announce a pullout date for U.S. forces starting next summer. Yes, he hedged the deadline as the start of a troop draw-down and left himself other outs. But in the region the deadline was taken as a signal that America lacks staying power. The Taliban have adopted a strategy to run out the clock. Having to think to a day when American won’t be here, Pakistani intelligence and some Afghans are talking about reaching an accommodation with the Taliban. Mr. Obama can help undo some of this damage if he will walk back from the deadline in terms clear enough for the Taliban and America’s allies in Kabul and Islamabad to understand. And while he’s on the subject, the President could again explain to the American people why he ordered 30,000 additional troops to Afghanistan and what’s at stake in a conflict that he once called the central front in the war against terror. His habit has been to give a big speech and then drop the subject, which in turn leads to waning domestic support. This is how to lose a war. Mr. Obama’s surge is an attempt to push back the Taliban and give the Afghans space to build a functioning state, while bringing the fight to al Qaeda and its allies in the border regions of nearby Pakistan. Were America’s commitment to flag, Islamists would claim a notable victory. Our own security would suffer greatly for it. After their success in Iraq, General David Petraeus, the head of Central Command, and his commander on the ground, General Stanley McChrystal, deserve the time and political cover for their Afghan counterinsurgency strategy to bear fruit. Ensuring that our soldiers have both is a test of Mr. Obama’s own staying power. Obama should be removed from office: the sooner, the better. This country does not need naive, arrogant, narcissistic demagogues like him who are nothing more than the moral equivalents of tin-horn dictators in Third World countries. Americans are dying in Afghanistan while Obama dithers, just as he has done with respect to the Gulf oil spill. [Turkey’s Prime Minister Recep Tayyip Erdogan], like most world leaders, had high hopes for President Obama. But now they see he is unable to master a dysfunctional system of government; that he may lose one or even both houses of Congress in November; and that Afghanistan appears to be headed for another debacle comparable to Vietnam circa 1975 (when Congress stripped South Vietnam of military aid, in effect inviting North Vietnam to administer the coup de grace). Clearly, the handwriting is on the wall with respect to Obama. Arnaud de Borchgrave, editor-at-large of The Washington Times and of United Press International, has written two more fine articles—in which he essentially argues that the Afghan war is hopeless—which are worth reading. Ann Coulter has a terrific article about this subject, which is worth reading too. A combination of the Afghan War, the oil spill, Guantanamo and his failure to act on immigration reform have all eroded his credibility with his liberal constituents. Now comes evidence that the war in Afghanistan cannot be won—certainly not with the effort and constraints now in place. . . . [T]he Afghan war is looking more and more like Vietnam. And now we have the equivalent of the leak of the Pentagon Papers discrediting the war effort from the inside. Arnaud de Borchgrave’s 2001 Interview With Pakistan General Hamid Gul, Former ISI Chief: What Does This Incredible Interview Mean To America Nine Years Later? A: Mossad and its American associates are the obvious culprits. Who benefits from the crime? The attacks against the twin towers started at 8:45 a.m. and four flights are diverted from their assigned air space and no air traffic controller sounds the alarm. And no Air Force jets scramble until 10 a.m. That also smacks of a small scale Air Force rebellion, a coup against the Pentagon perhaps? Radars are jammed, transponders fail. No IFF—friend or foe identification—challenge. In Pakistan, if there is no response to IFF, jets are instantly scrambled and the aircraft is shot down with no further questions asked. This was clearly an inside job. Bush was afraid and rushed to the shelter of a nuclear bunker. He clearly feared a nuclear situation. Who could that have been? Will that also be hushed up in the investigation, like the Warren report after the Kennedy assassination? Israel has now handed the Bush family the opportunity it has been waiting for to consolidate America’s imperial grip on the Gulf and acquire control of the Caspian basin by extending its military presence in Central Asia. Bush conveniently overlooks—or is not told—the fact that Islamic fundamentalists got their big boost in the modern age as CIA assets in the covert campaign I was also involved with to force the Soviets out of Afghanistan. Bush senior was vice president during that entire campaign. And no sooner did he become president on Jan. 20, 1989, than he summoned an inter-agency intelligence meeting and issued an order, among several others, to clip the wings of ISI (Pakistani Inter-Services Intelligence) that had been coordinating the entire operation in Afghanistan. I know this firsthand as I was DGISI at the time (director general, ISI). And now the Israelis have given the U.S. the pretext for further expansion into an area that will be critical in the next 25 years—the Caspian basin. The U.S. pushed for a broad-based Afghan government of seven factions and then waved goodbye. Even in the best of democracies, a broad-based coalition does not work. So we quickly had seven jokers in Kabul interested in only one thing—jockeying for power. The gunplay quickly followed, which led to the creation of Taliban, the students of the original Mujahideen, who decided to put an end to it. A: Democracy does not work. Politicians are constantly thinking of their next election, not the public good, which means, at best, constantly shading the truth to hide it from their constituents. Their pronouncements are laced with lies and the voters are lulled or gulled into believing utter nonsense. The Koran says call a spade a spade. It is the supreme law and tells right from wrong. There is no notion of “my country right or wrong” under divine law. The creator’s will predominates. All [is] subservient to Allah’s will and adherence to a set of basic, fundamental values. A: If Pakistan gives the U.S. base rights we will have a national upheaval. And if the U.S. attacks Afghanistan, there will be a call—a fatwa—for a general jihad. All borders will then disappear and it will be a no-holds-barred Islamic uprising against Israel and American imperialism. Pakistan will be engulfed in the firestorm. So I can only hope that cooler heads will prevail in Washington. A: If Taliban are given irrefutable evidence of his guilt, I am in favor of a fair trial. In America, one is entitled to a jury of peers. But he has no American peers. The Taliban would not object, in the event of a prima face case, to an international Islamic court meeting in The Hague. They would . . . extradite Osama to the Netherlands. Aisha is a victim of Taliban brutality, her nose and ears barbarically hacked off by her own husband in a warped punishment for attempting to flee her cruel in-laws. Held down by her brother-in-law, the young bride endured the agony of the man she married disfiguring her face with a knife. The photograph is a stark reminder of the fate awaiting independent-minded women if the Taliban regain power. Influential voices in Afghanistan are suggesting that the West must bring the Taliban to the negotiating table to thrash out a peace deal as part of the exit strategy. But women—who were treated as little more than slaves under the hardline regime’s rule—believe they will bear the brunt of any reconciliation. Aisha now lives in a secret women’s shelter in Kabul, but she dreams of leaving the Afghan capital and flying to the U.S. for reconstructive surgery paid for by a humanitarian organisation. There must be not be peace with the barbaric Taliban. They must be destroyed once and for all. Every women’s organization in America and worldwide must unite against the Taliban and its brutality. The world is full of suffering peoples and nations, but in the harsh, remote hills and plains of Afghanistan, the deprivation has been particularly cruel. Everyone knew it would take years to undo the damage wrought by the vicious gender apartheid of the Taliban. See Laura Bush, “Spoken from the Heart,” pp. 250, 252. Is the Media Missing America’s Upcoming Victory In Afghanistan? Russia is negotiating the sale of about 20 helicopters for Afghanistan, stepping up efforts to help the country’s U.S.-backed government battle the Taliban insurgency and drug traffickers. Are we missing something? Isn’t this the same Russia that invaded and destroyed Afghanistan and killed its people, and subjected others to lives of misery? Yes, the former Soviet Union and Russia are essentially one and the same; and Putin was a KGB operative all of his life before he entered politics and became Russia’s dictator-for-life. Russia is not America’s friend, or a friend of the Afghan people or NATO. It is our enemy, and should be treated as such. The sooner that Putin and his thugs are eliminated permanently, the better this world will be! Query whether any American or foreign politician, such as Barack Obama, has the guts to take a strong stand: the poppy crops must be eradicated! 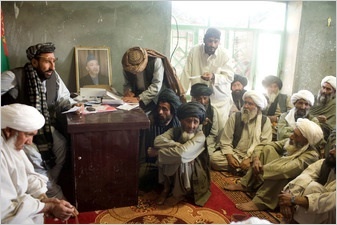 The Los Angeles Times has a fine article about the cruelties and draconian punishments inflicted on the Afghan people by the Taliban and its edicts, which is worth reading. It describes how a young couple was stoned to death to carry out a mullah’s death sentence, handed down after the pair eloped against the wishes of their families. This barbarism harkens back centuries ago, and has no place in the 21st Century. As speculation is rife in Washington about Barack Obama “victory” speech concerning Iraq, the Wall Street Journal has an editorial that is worth reading; and Senator John McCain has written an op-ed piece that is also excellent. For openers, John McCain in a bona fide hero on a variety of fronts, not the least of which is that he was the champion of the “surge,” which has won the war in Iraq. He advocated it when most “experts” thought it was a crazy idea. He sold it to George W. Bush, who had the courage to implement it, and the rest is history. The first is to give his predecessor credit for deciding on and sticking with the 2007 troop surge that turned the tide against the insurgency. George W. Bush made that decision in the face of ferocious bipartisan opposition, not least from [Obama]. If Mr. Obama wants to win some bipartisan goodwill, he’ll admit he was wrong at the time and say he has learned from the surge’s success in Iraq as he has planned his own surge in Afghanistan. This [surge] policy was savaged by Democrats in Congress—including then-Sens. Barack Obama, Joe Biden and Hillary Clinton—all of whom called for withdrawing U.S. forces regardless of the conditions or consequences. It would be nice if President Obama could finally find it in himself to give his predecessor the credit he deserves. Regrettably, Obama is a partisan, raving narcissist who has no class. The likelihood of him praising Bush or his surge—much less praising McCain for his courageous role in that decision making—and admitting that he was wrong, are slim to none. The domestic economy and his Afghan war alone are dooming him to failure; and it is likely that he will be a one-term president who does not run for reelection, like Lyndon Johnson in 1968. A mood of defeatism is growing about Afghanistan, just as it once did with Iraq. Indeed, many of the same critics that would have delivered failure in Iraq are back again with calls for unconditional troop withdrawal, partitioning the country, a retreat to large bases and so on. We can succeed in Afghanistan, but we need to give [our policies and our commander, Petraeus] the necessary time to work. That’s the best and fastest way for our troops to come home, as they are now from Iraq. A democracy that allows half its population to be silenced by fear, violence or intimidation is not a democracy. And a society that fails to protect the rights of women is not a free society. Afghanistan’s leaders must defend women’s rights with action and policy, not just lofty rhetoric. True reconciliation cannot be realized by sacrificing the rights of Afghan women. To do so would reverse Afghanistan’s progress and return its people to the perilous circumstances that marked the Taliban’s rule. There are clear choices for those entrusted with ensuring Afghanistan’s peace and prosperity. Will Afghanistan be a nation that empowers women, or one that oppresses them? Now is a moment of decision. It is incumbent upon the Afghan people to make the most of this moment in their history. The Washington Post has a moving article about a young enlisted man who was injured in Afghanistan, which every American should read. [T]he explosive device . . . tore off his hands and lower legs. The blast broke his jaw, punctured his ear drums and left him, according to the latest statistics, one of only three men—a soldier and two Marines—from the wars in Iraq and Afghanistan to survive an attack as a quadruple amputee. Enormous courage, and faith. It puts our daily travails into perspective. Also, the advances in technology and therapy are mind-boggling. Let’s hope and pray that Nice and Crystal have a wonderful and loving life together—and tell their children, grandchildren and others never to give up, and to walk through Hell if necessary, and come out the other side. However, such words barely touch on and inadequately describe the sacrifices that Nice, Crystal and other brave and selfless Americans make in the service of their country. Nice and Crystal are American heroes, both of them. What they and other members of our military have done, and are doing, has been happening each and every day since this great country was founded—at places like Valley Forge and Gettysburg, and at other locations worldwide that none of us have heard of or traveled to.